So, today, I told Gary that Xavier was feeling lousy. Was Gary concerned? Oh no! He said, "Oh, maybe I'll be able to whip him at checkers, tonight." "Great post honey! Thanks for making me sound like the village idiot (and an insensitive one at that). 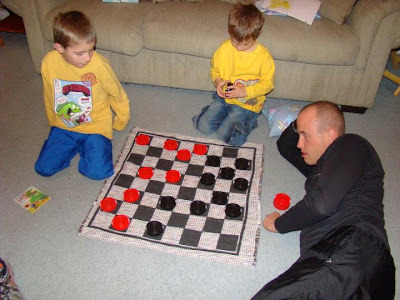 What my wife failed to mention is that I've been playing checkers with my son for several weeks. Initially I started out taking it easy and showing him different ways to trap and defeat his opponent. Obviously he learns fast as he quickly progressed to trapping me on numerous occasions. I suddenly found myself on the defensive against a seven year old! He's doing very well, so I think it's time to move on to chess. Whatever. Don't be so defensive. Just remember that your goal in life is to make him better than you, right?